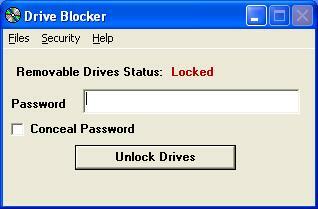 Drive Blocker is a software program for Windows XP computers (does not work on Windows 95/98/Me/2000/NT) that allows your computer to block removable drives to prevent people from using any removable drives or media, such as flash drives (sometimes called thumb drives), CD's, or floppy drives on your computer. A password (selected by you when you install Drive Blocker) is required in order to reactivate the removable drives. Once Drive Blocker is installed, any removable drives that are connected to the computer will be immediately disabled when Windows starts. If anyone tries to insert a disk into a CD drive or floppy drive, that drive will be disabled. To access a removable drive, you must view the main Drive Blocker screen by clicking on the Drive Blocker icon on the system tray and then input a password (selected by you when you install Drive Blocker) BEFORE you connect the removable drive or insert a disk. You can then access the removable drives freely until you lock the removable drives again using Drive Blocker. 1) It prevents people from putting unauthorized software or other files on your computer. 2) It prevents the spread of viruses, trojans, and worms from disk to your computer when people try to run software or files from their own disks. 3) It prevents theft of data from your computer. 1) Companies that wish to stop employees from installing software they bring from home onto company computers because this practice can violate the software license, making the company susceptible to legal action. 2) Companies that wish to prevent employees from installing games or other distracting software on company computers. 3) Companies that maintain sensitive financial records, such as credit card information, from their customers and wish to protect these records from theft. Identity theft caused by employees copying company data from their company's computer is a major problem. 4) Companies that maintain other confidential information, such as medical records, and are required to protect these records. 5) Companies that have had trouble with computers becoming infected with viruses due to employees using disks they bring from home. Drive Blocker is available as shareware for $20 for one license, with volume discounts available. (To use a volume price calculator, click here.) Try it for a month to see if you like it before you have to pay for it. Just download the install file to your computer, then run the file like a program by double-clicking on the install file in Windows Explorer or My Computer to install Drive Blocker. Remember that complete instructions are provided for uninstalling Drive Blocker if you decide that you do not like it. Drive Blocker runs on Windows XP computers ONLY. Do not attempt to use it on Windows 95, 98, 2000, ME, or NT computers. Click here to download the installation program (dbarc.exe). If you like this program, but would like to see some improvements or additional features, contact Leithauser Research at Leithauser@aol.com or (386)-410-6769 and describe the addition features you would like to see in this program. If they sound like good ideas, we will add the improvements at no charge. Just part of our customer service!